Quick Set Roof Coatings - Don't Let Light Rain & Dew Stop You! Don't Let Light Rain & Dew Stop You! AcryShield® Quick Set roof coatings are specifically formulated to resist early wash-off associated with light rain and heavy dew weather conditions. 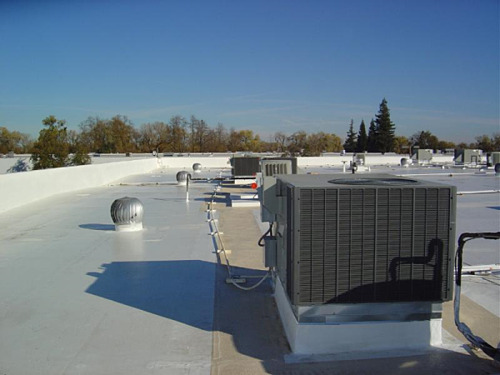 Contractors are able to complete their roof installation job without worry that the system will not set-up during these weather conditions. AcryShield Quick Set base coat and top coat roof products can be applied on virtually any roofing substrate including: BUR, Mod Bit, Asphalt, Hypalon, EDPM, TPO, PVC, Metals, SPF, and Concrete. AcryShield A602 is a quick-set base coat for single-ply substrates. This high performance base coat has the technology to coat directly over hard to coat substrates such as Hypalon, TPO, and EPDM. A602 eliminates the need for a costly single-ply roof tear-off and removes the need for pre-treating an EPDM membrane with a caustic solution to obtain adequate adhesion. AcryShield A603 is a water borne, quick set base coat for surfaces such as Concrete, BUR, Mod Bit, and Asphalt Emulsion. A603 provides superior protection against ponded water. AcryShield A600 is a ZERO VOC, premium elastomeric, quick-set top coat that has optimum adhesion over SPF, Metal and Concrete. AcryShield A600 is excellent where extra levels of low temperature flexibility are required. A600 exceeds ASTM D6083 requirements for critical properties such as tensile strength, elongation, wet adhesion, and weatherability. This top coat also includes a fire retardant package. AcryShield A610 is a ZERO VOC, premium quick-set top coat that has optimum adhesion to SPF and is excellent where extra levels of low temperature flexibility are required. 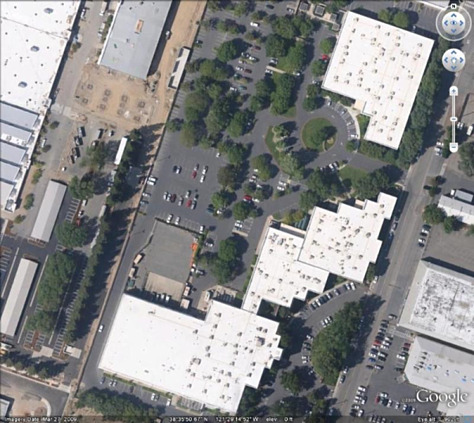 A610 can be coated over a variety of other surfaces as well, including Asphalt, Single-Ply, Metal, and Concrete. A610 exceeds ASTM D6083 requirements. AcryShield A640 is a ZERO VOC, premium elastomeric, quick-set top coat that has unique bleed blocking properties that make it particularly suited for coating over Asphalt, BUR, and Mod Bit surfaces. A640 can also be coated over Metal, and Concrete. A640 exceeds ASTM D6083 requirements for critical properties such as tensile strength, elongation, wet adhesion, and weatherability. 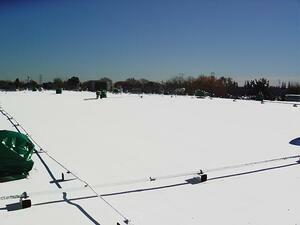 Can I apply roof coatings in the early spring? We are rapidly approaching the beginning of the waterborne roof coating application season where climates and temperatures are typically still fluctuating depending on your geographical location. 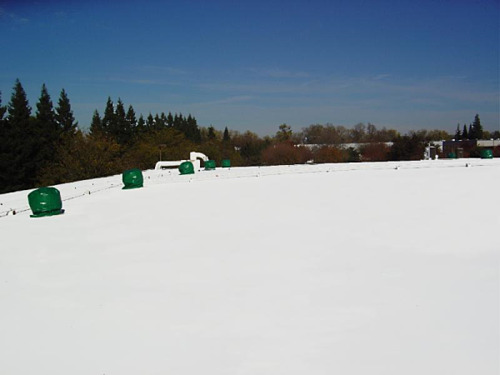 Contractors need to know the limits of a roof coating application in order to plan for a successful project and not have problems with coating wash-off or freezing. Here are a few simple guidelines to follow to insure a successful project. 1. First, be certain the roof substrate is dry before applying new coating. This means all the dew has evaporated and insuring the base or intermediate coating are fully dried before applying a fresh coating. If the roof is dark in color where the substrate is dark, or the base coat is dark, the roof will dry more quickly than if the surface is light in color, such as a white single-ply. Using a National Coatings Quick-Set product is ideal for resisting early-wash off during light dew. 2. 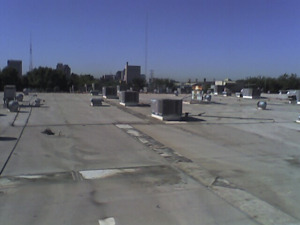 Be sure the air temperature is at least 50°F and rising during the coating application process. 30-60 minutes before any possible light rain or mist. This should allow time for the coating to skin over and prevent wash off. (Don’t let light rain or dew stop you! Download our Quick-Set Brochure for more information.) Never coat when there is a chance of frost before the coating has dried. 4. If hard frost or extended cold weather is forecast, be sure to store unused roof coating in a warehouse or environment where the temperature is above freezing. Typically, if coating in a can or drum freezes, it is unusable. 5. Obviously, the same rules apply for waterborne coating application in the early spring. In summary: The key to a successful roof coating application in the early spring is to pay careful attention to the short range weather forecast, and not "push the weather envelope". For any additional questions, please contact your National Coatings sales representative or go to our contact us page and send us an email!